World Record Cyclist and the Rugby World Cup in Alresford! Something for you to tell your grandchildren maybe! 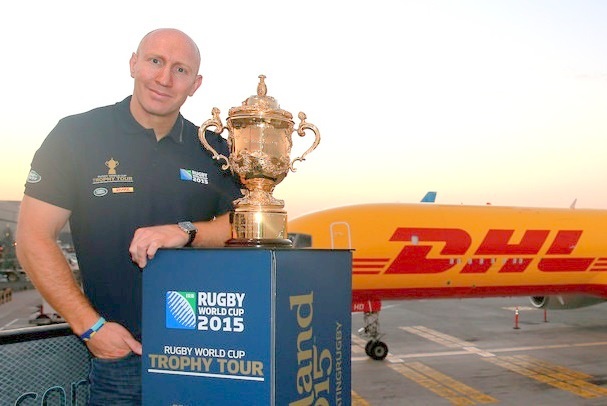 The Webb Ellis Cup, the Rugby World Cup, came to Alresford in August this year. On 26th August it arrived at Arlebury Park, as did the rain. The Alresford Rugby Club had arranged a full day of events to celebrate this, with an afternoon and evening of FUN RUGBY for EVERYONE. As they said, “Keep that date free to join Alresford Rugby Club, the community of Alresford, and Rugby enthusiasts from far and wide”. I’m sure there were some stalwarts out playing in the mud! The Webb Ellis Cup is the trophy awarded to the winner of the Rugby World Cup, the premier competition in men’s international rugby union. The Cup is named after William Webb Ellis, who is often credited as the inventor of rugby football. The trophy is silver gilt and has been presented to the winner of the Rugby World Cup since the first competition in 1987. The 38 centimetre trophy weighs 4.5kg, is gilded silver and is supported by two cast scroll handles. On one handle there is a head satyr, on the other there is head of a nymph. On the face of the trophy, the words International Rugby Football Board and below that arch The Webb Ellis Cup are engraved. ARFC has its own website, for more info, www.alresfordrfc.co.uk. Plus a cycling World Record holder! On Saturday 22nd August Dominic Irvine visited Alresford Library, to meet fellow cycling enthusiasts. Dominic and Charlie Mitchell broke the World record, in May, for cycling non-stop between Land’s End and John O’Groats on a tandem, smashing the 1966 record by a massive 5 hours! During his visit to Alresford Library he talked about long distance cycling and making world records – or at least one record! When visiting the Alresford Surgery, you may have seen a notice in the waiting room that some of the chairs there were provided by the Edward Pay Medical Fund. Certainly I wondered about this, and it took me a while to learn a little more. 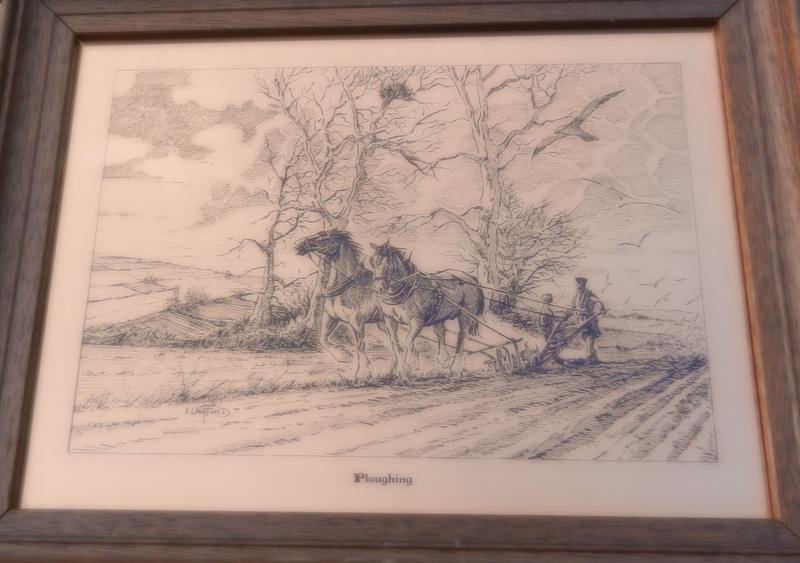 Edward Pay was a builder, originally from Liss, who worked around Alresford from the 1920s onwards: in those days when travel in the countryside was by horse and cart, or walking, he would have lived near the job in a caravan or in lodgings, at least through the week. With his workmates he built a Mausoleum at Old Alresford Church, and then did some further work on the old Perin’s school buildings at the top of the Dean. As any good builder he noticed all the pretty girls walking past, and he his wife-to-be, Ada White, walked past the school house every day on her way from her home in the Dean, to her work at Upton Park House. 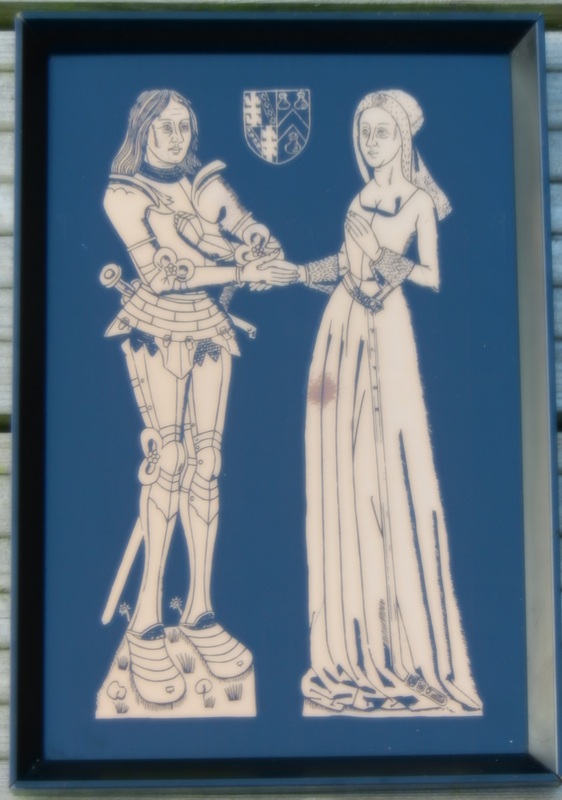 Edward and Ada were married in Alresford in the 1930s – married in a service conducted by his cousin, Rev Harry Carpenter (who later became Bishop of Oxford). They set up home in Ashburton Place, as it was then known: it is now Ashburton Road. 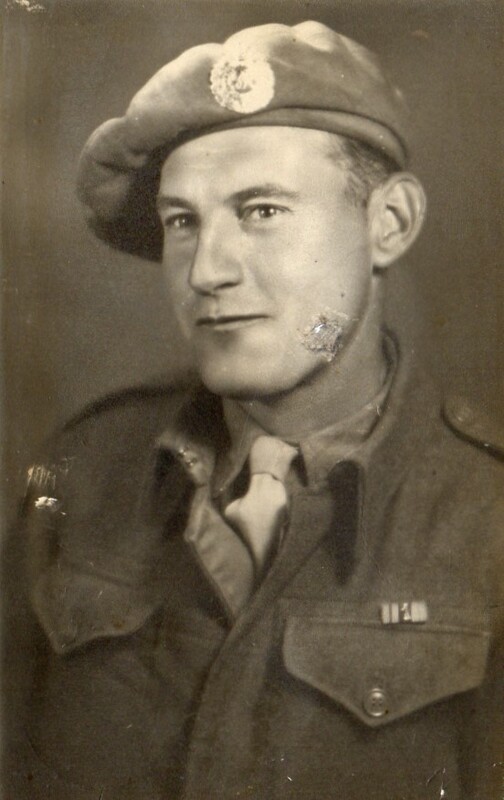 He continued working as a builder around Alresford, and had a large family, including seven grandchildren. He was always pleased that his two sons, David and Richard, were volunteers in the Alresford Fire Brigade. As most Alresford residents, Edward was always a patient at the Alresford Surgery in Station Road. In the 1980s he developed lung cancer, and the Surgery there treated him for this. During the final stages of the disease he needed injections of morphine, and the Surgery, who did not have the morphine syringe driver needed for this treatment, had to borrow one from other NHS surgeries, usually from Andover. Because of the support provided by the Doctors and Nurses in the Alresford surgery, Edward requested that at his funeral – which came in 1988 – any collection should be used to help provide the Alresford Surgery with equipment that would help the community when attending the surgery, but that was not normally provided by the NHS. This first collection raised £500. The Pay family consulted Dr Brill, who advised that to operate effectively the fund should be organised as a Registered Charity, and Mr Alexander in Old Alresford helped create this. A significant benefit of being a Registered Charity is that any charitable purchases made to help people who are disabled or terminally ill are exempt from VAT, which is the Government’s contribution to providing support. With the help of various fund raising events run in co-operation with the Surgery, the Fire Station, and Edward’s many friends – for example BBQ events, country dances at the ARC, local sausage and cheese tasting evenings, and notably a sponsored cycle ride to Liss and back – the charity raised over £80,000 over the first 20 years. 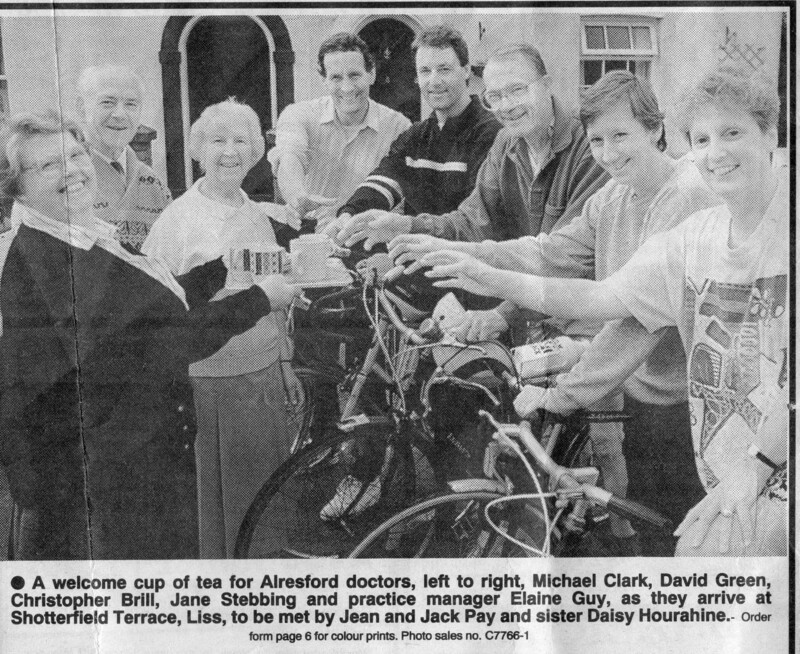 The cycle ride to Liss covered 66 miles, and was undertaken in 1991 by Dr Green, Dr Tanner and Dr Jane Stebbing, with the practice manager Elaine Guy, as seen in the photo: Dr Brill is in the middle of the cyclists, and they are being greeted here by Edward’s Liss-based relatives, Jean and Jack Pay and Edward’s sister Daisy Hourahine. This was a major initial event for the charity, and raised over £2500 for the fund, which then could afford the £5000 needed to supply the first defibrillator at Alresford Surgery. This is shown in the second picture, when it arrived in the Surgery, with Dr Clark, Dr Green and two of Edward’s children, Pamela and Richard. Some money was indeed used for the chairs in the waiting room, but also for the first set of electric doors on the Surgery entrance and the TV screens in the waiting room, as well as the disabled person’s toilet equipment. 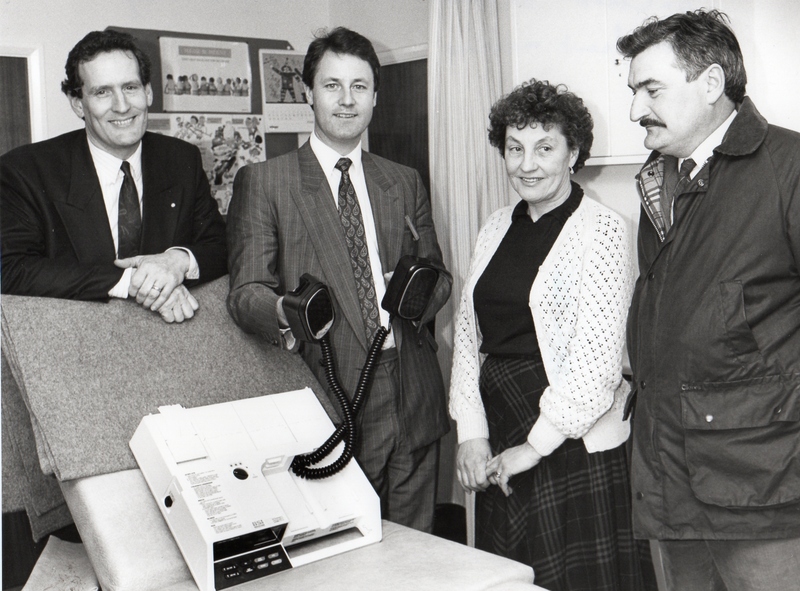 More directly for medical equipment, the Edward Pay Fund has helped equip the Nurses’ Surgery rooms with equipment and cabinets, and of course initially bought a morphine syringe driver, and then spent £5000 on the defibrillator. In 2015, morphine syringe drivers are available on the NHS, and now four or five are in use in the Alresford area, but the Edward Pay Charity enabled this advanced equipment to be provided before such Government funding became allowable. Contributions to the fund have come from many sources, from grateful patients and in bequests from the Alresford townspeople: Alresford businesses have also been generous in providing raffle prizes and support for fund raising events. 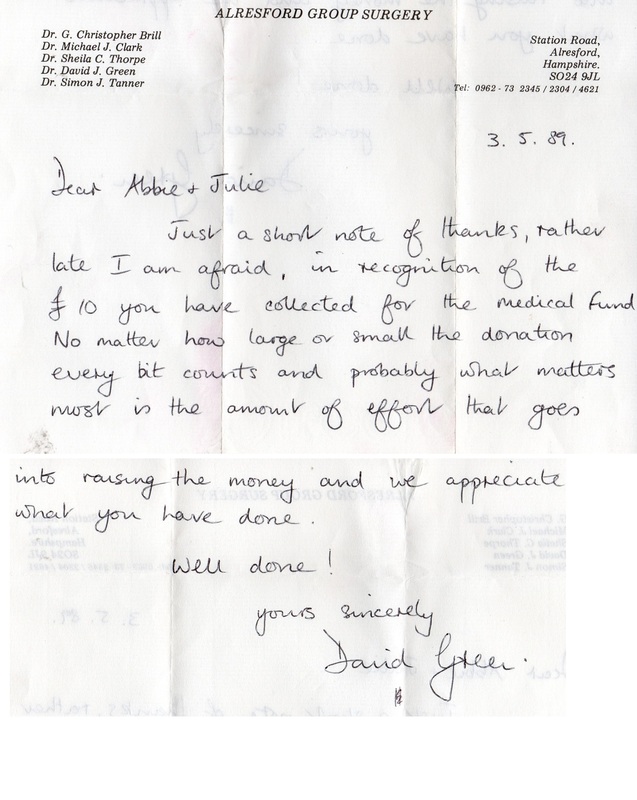 One of the first fund raising table top sales was organised by two of Edward Pay’s grandchildren, Abbie and Julie Pay, in 1989, when they raised £10 by selling some of their toys from a stall in Beech Road, set up outside their home: the letter of thanks from Dr Green is shown here. Edward’s son Richard and daughter Pam recently presented some of this history at a coffee morning meeting in St John’s Church, and were proud to say that even the TV screens in the waiting room, with the annoying health messages, had actually helped a patient have a check and get treatment for a major health problem, only identified by the screen messages! Over the last five years the income and spend by the charity has tailed off, to below £2000 total: it is hoped that this can be increased once again. The charity is still active, and still keen to provide funds for any equipment for the Surgery that is needed by the community. The provision of medical and other equipment and materials for the benefit of the patients of Alresford Group Surgery, or of any other practice of general practitioners in the area. The Charity is based at the Alresford Group Surgery, and the Trustees are David Pay, Pamela Page and Richard Pay, who are Edward Pay’s children, and Dr Richard Cribb and Health Care Assistant Lyndsay Curran of the Alresford Surgery. Other charities in Alresford are listed in a previous Alresford Memories post, “Charities in Alresford: Now, and in the past”, posted on 29 January 2015. Issue number 5 of “Alresford Articles” has recently been published. 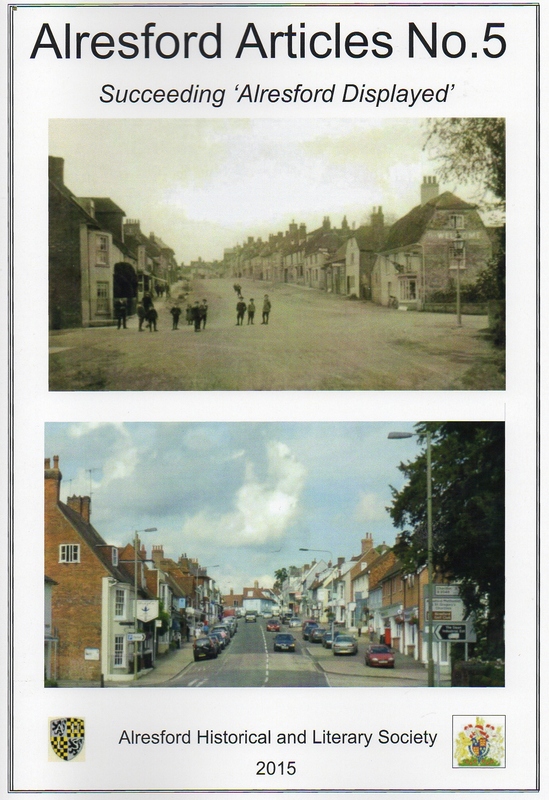 This is the latest in a series of A4 sized booklets which presents a number of local history articles, by local people, continuing the tradition started by “Alresford Displayed”, a similar series of publications. These were started in 1976, and the last issue, number 22, was published in 1997. Alresford Articles is published by the Alresford Historical and Literary Society, www.alresfordhistandlit.co.uk, and any profits arising from sales of the booklets are used to help the society’s funds. Copies are available priced at £4.80. The Society was formed in 1966 to bring together members of the local community and encourage interest in the History, Literature and Archaeology of Alresford and the surrounding areas. It has been instrumental in recording the area’s history and events as evidenced by the publication of the original twenty-two original Alresford Displayed booklets. Many of our members have played a pivotal role in the ongoing social and commercial life of our attractive town. Monthly meetings are held in the Methodist Church, Jacklyns Lane, Alresford SO24 9JJ, where a balanced programme of talks and presentations takes place in a friendly atmosphere. Meetings are normally held on the third Wednesday of the month, and it is not necessary to be a member to attend – visitors are welcome at the door for a small fee. Refreshments are provided. The topics selected for the monthly talks give an insight into the influence that the political, social and industrial heritage has had on our Community and Hampshire. To stimulate the literary interests of the members, lectures are also chosen to illustrate the work of authors and artistic personalities. 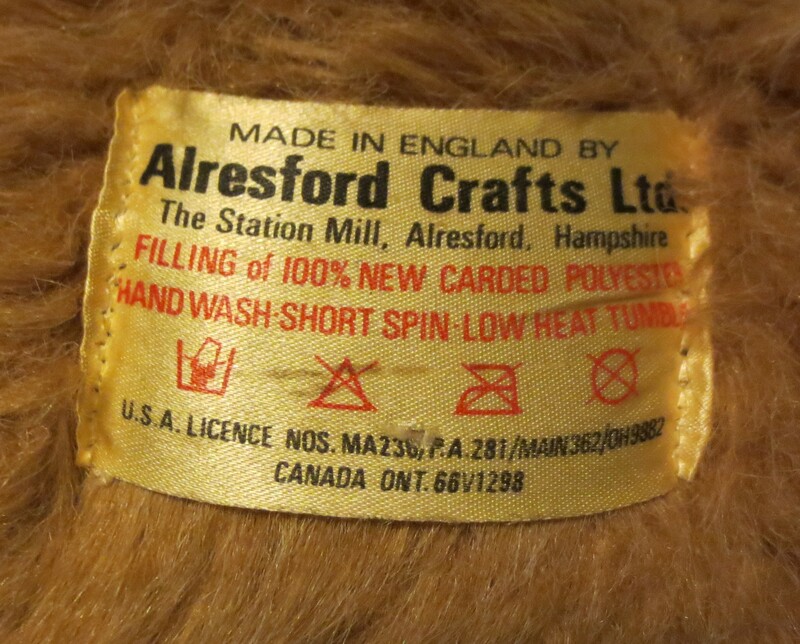 Horace, the Alresford Bear, has a website, http://www.horacethealresfordbear.com, and this has provided some interesting analysis of the labels used on Alresford Crafts Bears over the years. So this is the story, as below, and maybe you should visit his website to see what he has been doing? 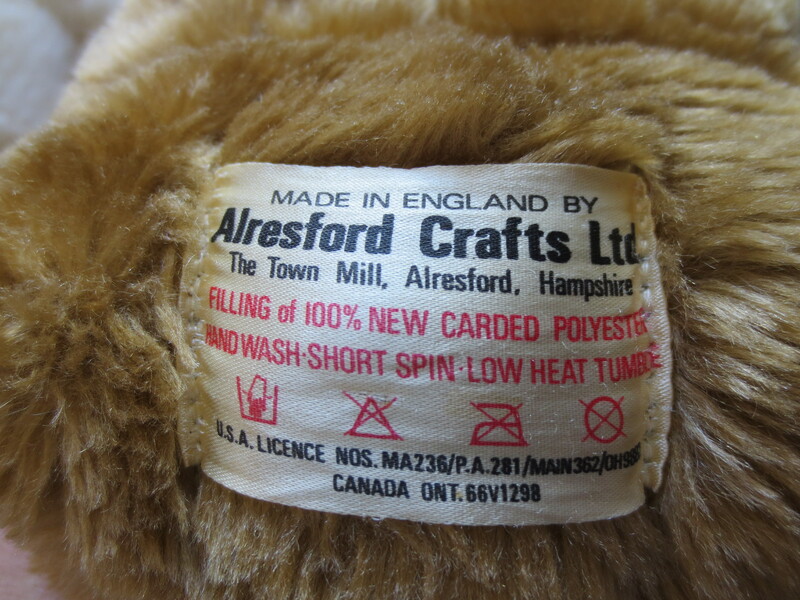 Alresford Crafts, based in Alresford, Hampshire, England manufactured soft toys from about 1970 until 1992 when they ceased trading. They were exported worldwide and many seem to have ended up in USA and Japan. 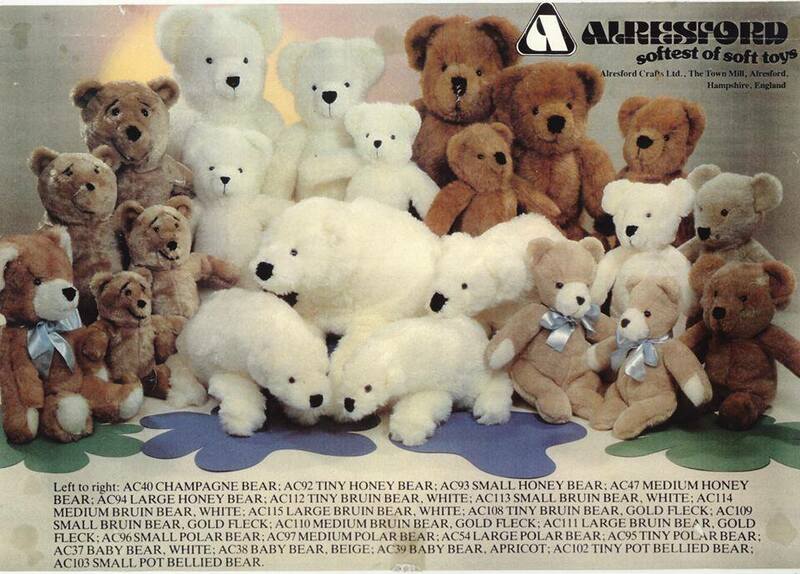 Here is a page thought to be from a 1980’s Alresford Toys Catalogue, which shows bears that look like Horace in various sizes. 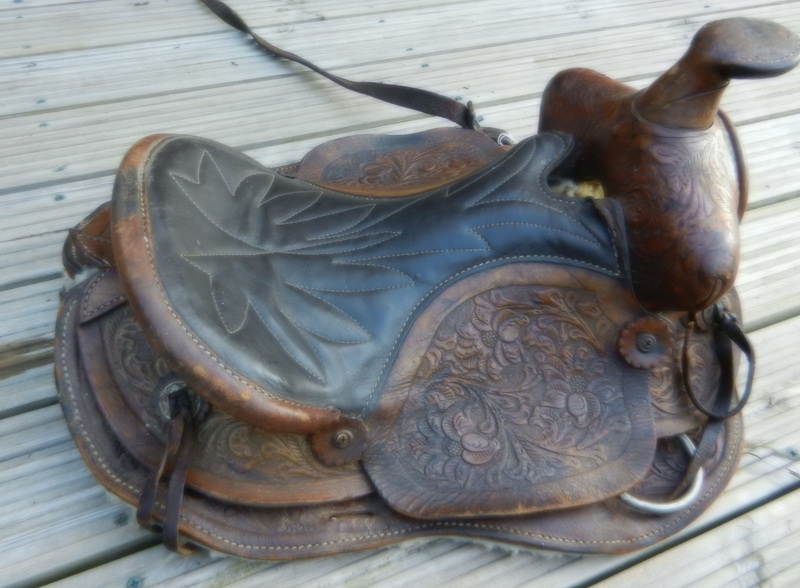 All the bears in this style were known as Honey Bears, and all had flat bottoms that enabled them to sit without being propped up by something. 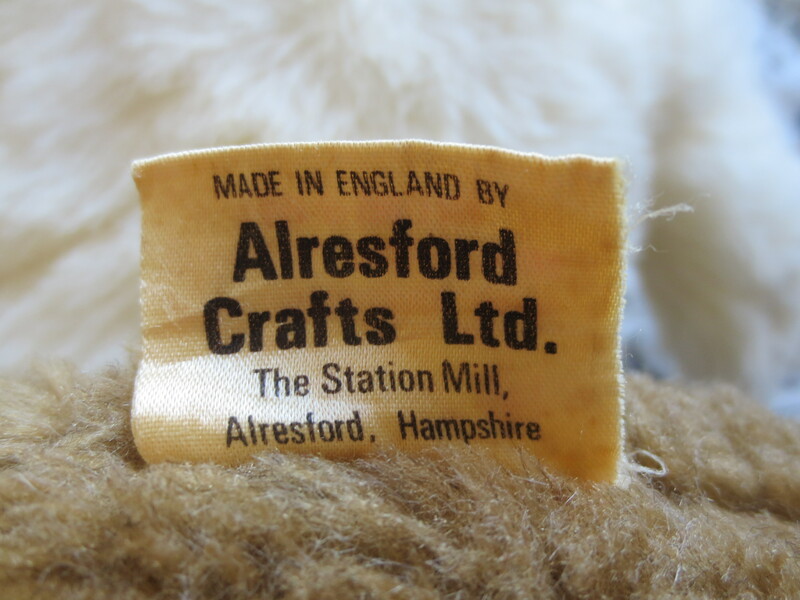 If anyone has any more information about Alresford Crafts Karen would be delighted to hear from you, via Horace’s website. 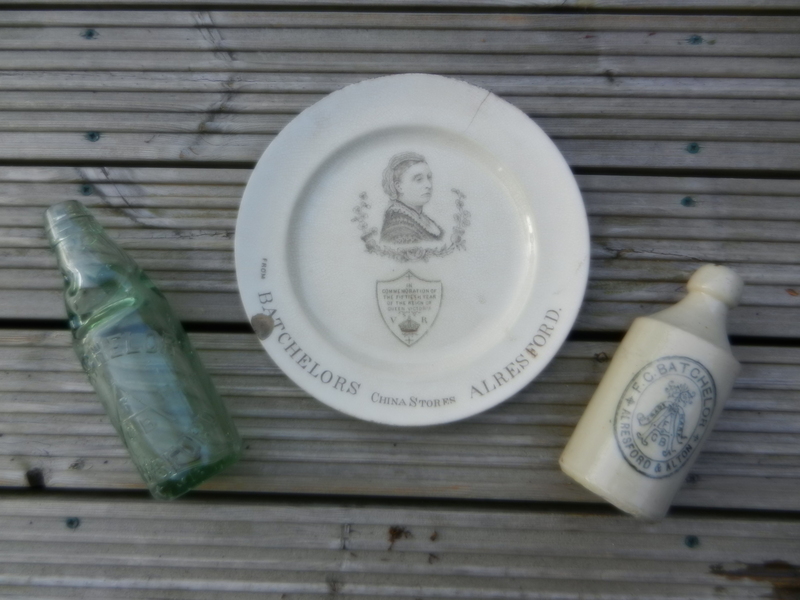 Or send info to Alresford Memories on here too.